Australia, Algeria, and Equatorial Guinea. Another three countries that have job opportunities offered to many Filipinos. Australia ranks as one of the best countries to live in the world in terms of wealth, education, health and quality of life. Algeria and Equatorial Guinea, on the other hand, are countries, both producers of oil and gas. Algeria being a gateway between Africa and Europe has abundant oil and gas reserved while Equatorial Guinea is a small country on the west coast of Africa. Since mid-1990, it has become one of Sub-Sahara's biggest oil producers. 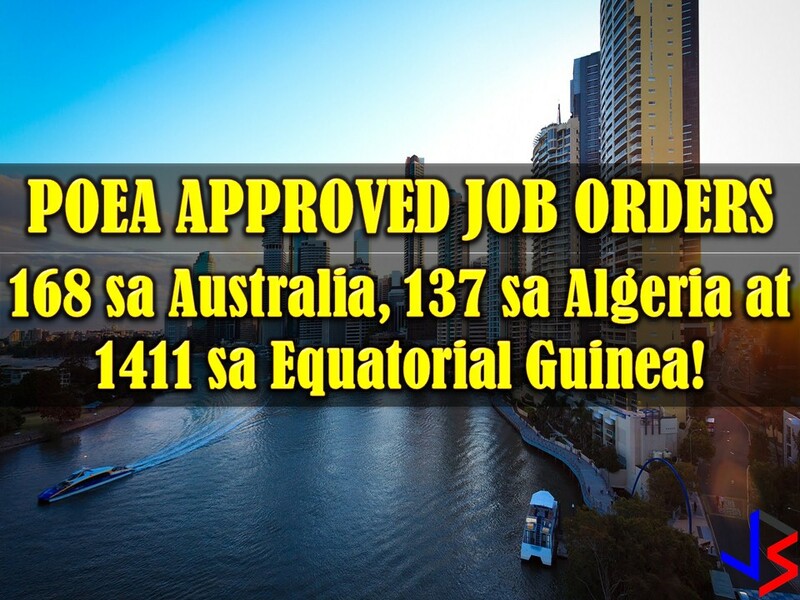 This November 2017, the Philippine Overseas Employment Administration (POEA) has approved many job orders for three countries. Scroll down to see the listing with information of recruitment agencies where the interested applicant may apply.